An exclusive discount offer for our disc hardware purchasers. Whether you’re purchasing a fast and affordable disc duplicator or disc printer, the Disc Makers DISCount Program is a bonus on blank disc pricing for you or your business. All you have to do is purchase a manual or automated disc duplicator or one of our disc printers, and you will be automatically enrolled into the Disc Makers DISCount Program. The DISCount Program gives you deep discounts on all future blank media orders placed with your account—for life. That’s cheap blank CDs and DVDs for life! Why order blank media from Disc Makers? The blank media you use may be the single most important factor in determining the quality of your finished product. That's why Disc Makers sells only Grade-A media, including Verbatim, and Falcon blank discs—all known throughout the industry for their superior quality. We also offer Disc Makers Ultra brand media, which boasts the lowest reject rate of any CD-R guaranteed. In addition, the aggressively priced Disc Makers Premium blank discs, offer performance and value like no other. 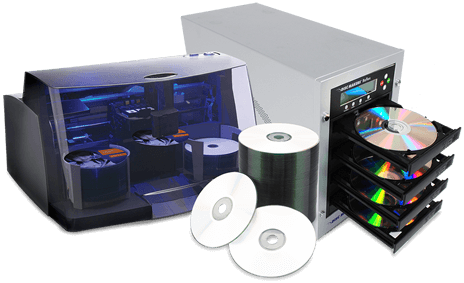 Choose from silver or white inkjet printable blank discs, Thermal, and HydroShield or upgrade to 24K Archival gold CDs for long-term storage of sensitive data, video, music and images. And because we ship directly to you, we can offer industry-leading compatibility and quality at prices you won't find anywhere else. Save even more with Free Shipping included in our DISCount Program. No minimum order required! If your business is in constant need of blank media and needs a professional DIY solution, then the Disc Makers DISCount Program is right for you. Find the perfect disc duplicator or printer for your business and automatically enroll in the Disc Makers DISCount Program to enjoy lifetime savings on blank CDs and DVDs.